Helps prevent age-related decline in cognitive function (attention, memory). 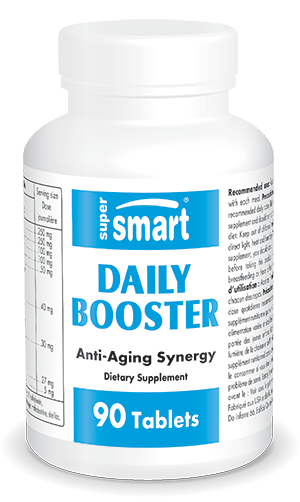 Daily Booster provides ingredients which act synergistically on various mechanisms of ageing to help slow down its progress and effects. ¤ Acetyl-L-Carnitine Arginate and R-lipoic acid combine to protect the long-term health of mitochondria. This combination stimulates activity of an enzyme, acetyltransferase carnitine, which plays an important role in fuel-burning in the mitochondria. Benefits observed in studies include improvements in memory and hearing. ¤ Carnosine (beta-alanine-L-histidine), a dipeptide naturally present in the body, protects cell proteins against glycation (cross-links between proteins and sugar molecules). It is also a potent antioxidant. ¤ Benfotiamine, a fat-soluble form of thiamine – or vitamin B1, inhibits the formation of advanced glycation end products, the result of glycation. ¤ Trans-resveratrol, quercetin and oligomeric proanthocyanidins (OPCs) extracted from maritime pine bark and grape seeds (Vitis vinifera) are powerful antioxidants and mimic some of the effects of calorie restriction. • Because of its exceptional stability, PQQ is a powerful antioxidant weapon, far superior to classic antioxidants at protecting mitochondrial DNA. It can carry out a great many electron transfers, and thus neutralise the main free radicals which impede healthy mitochondrial function, without suffering any molecular breakdown. Unsurprisingly, PQQ is thus extremely effective at fighting age-related degenerative diseases and energy decreases in the body’s two most important organs: the brain and the heart. • Most importantly, PQQ is also effective at promoting mitochondrial biogenesis. It activates the genes which control reproduction of mitochondria, stimulating their generation even within senescent cells. As we get older, our cells lose mitochondria which results in the energy deficits associated with the majority of degenerative diseases. PQQ is the only substance known to be able to promote mitochondrial biogenesis. Combining ingredients that scavenge free radicals, stimulate mitochondrial function, help prevent and destroy glycation cross-links, inhibit inflammatory molecules, boost the immune system and promote mitochondrial biogenesis, PQQ-enriched Daily Booster is the perfect formulation to stem the advance of the ageing process and its effects and to complement the action of your normal, daily multivitamin supplements. Other ingredients : calcium phosphate, microcrystalline cellulose, magnesium stearate, silicon dioxide, sodium . Adults. Take one tablet with each meal, or as advised by your therapist.